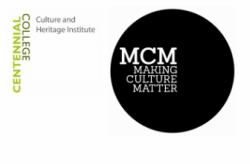 Making Culture Matter held a Guest Speaker Series during March and April 2012. The series took place at Centennial College Progress Campus at 940 Progress Avenue, Library and Administration Building, Room L1-16. Free admission. 2012/03/15: "Our Canada, Your Canada"